← Can PDF To Image Converter convert graphs such as rectangle into ras? When you convert emf to ps, VeryPDF HTML Converter command line will do a great favor.VeryPDF HTML Converter command line is a powerful software which allows you to create previews or thumbnails of web pages in a number of different formats only by some easy commands, such as TIF, TIFF, JPG, JPEG, GIF, PNG, BMP, PCX, TGA, JP2 (JPEG2000), PNM, etc. It also allows you to convert web pages to PDF, PS (postscript), WMF, EMF vector formats.You can download the software at the website http://www.verypdf.com/htmltools/index.html and if you want to dive into more about it,you can read the user manual at http://www.verypdf.com/htmltools/htmltools-manual.htm. 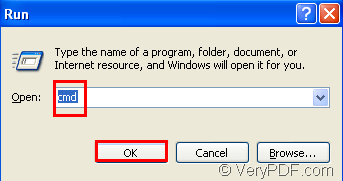 Before you convert the image of emf to ps format file,you should run cmd.exe in your computer.You can follow the steps below. Click “start” – “run”.Just input “cmd” in “open” edit box,then click “OK” button.Please look at figure1. 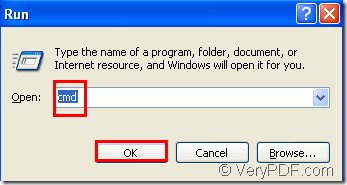 Then the cmd.exe dialog box will pop up.If you have run some procedures before and don’t want to be too disorderly in the dialog,you can clear the screen by inputting the command “cls”.Then press “enter” button on your keyboard.Please look at figure2 and figure3. Now you can input commands to convert emf to ps.Please look at figure4. "C:\Documents and Settings\admin\Local Settings\Temp\htmltools\htmltools.exe" means the directory of htmltools.exe which you need to call. "C:\Program Files\docPrint Pro v5.0\blank.emf" means the directory of source emf file. blank.ps means the name of target ps file. After you convert emf to ps by VeryPDF HTML Converter command line,the target file will be saved in C disk,please look at figure5. How to convert a document of mht to ps file? How to set the margin and convert HTM to PDF? How to convert wmf to bmp?